A group of protesters, including her two teenage children, chanted “liberation, not deportation” as they surrounded a van for nearly three hours to keep it from leaving an Arizona immigration center with Rayos inside, an organizer, who asked not to be named, told Fusion. One protester, Manuel Saldana, bound himself to the van’s tire. 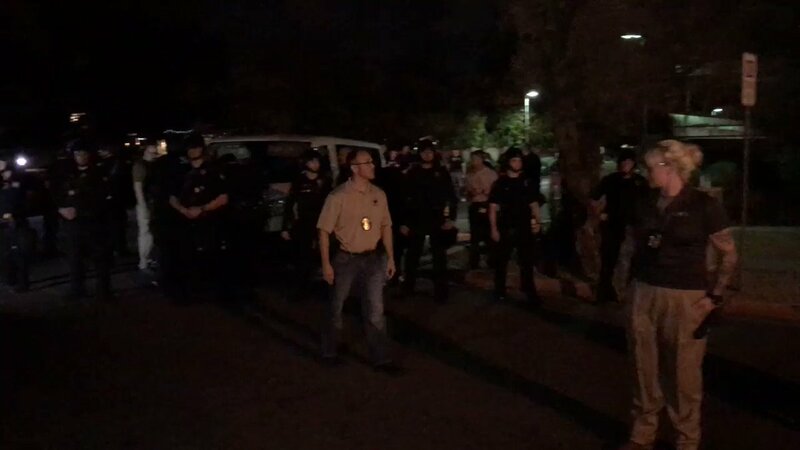 #BREAKING– Crowd of about 40-50 protestors blocking #ICE deportation vans in PHX. #GuadalupeGarcia believed to be inside. family in tears. Man who jammed himself in the wheel well of the #Deportation van has been arrested. UPDATE, 1:31 pm: Rayos’ attorney confirmed to Fusion that Rayos was deported this morning. The organizer, who works with Puente Arizona, an immigrant advocacy group involved in the protest, said Rayos’ kids felt “really betrayed,” especially after mayor Greg Stanton announced last week he would not make Phoenix a sanctuary city. “It’s not fair that my mom might be taken away for providing for my family,” Rayos’ daughter Jacqueline said in a statement. Under Trump’s policies, an estimated eight million immigrants could be targeted— around five times as many as under Obama. “Those are numbers that are high enough that even people outside of the immigrant community will notice their neighbors are missing,” organizer Tania Unzueta told Fusion this week. On Thursday afternoon, Rayos’ attorney confirmed on a call with organizers and reporters that she had been deported to Mexico.